"The area of Astoria and Warrenton is a nationally significant historic region at the western end of the Lewis & Clark Trail. 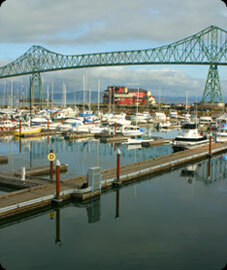 Astoria is the oldest American settlement west of the Rockies; a place that takes visitors back to simpler times, its architecture dominated by hundreds of Victorian homes clinging to steep wooded hillsides and with a revitalized 1920s era downtown; all set against a backdrop of tremendous natural beauty in the temperate rain forest at the mouth of the Columbia River. Visitors have an opportunity to escape into an appealing, intriguing past."